(Budget Travel) -- With rates as low as $36, these flashy new European hotels take the convenience of the pod concept and expand it with style. 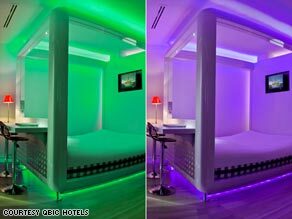 Qbic hotels have a clever lighting concept -- Deep Purple Love, anyone? You can pick the color you like, or turn them off altogether. Where: Inside terminals at London's Gatwick and Heathrow airports (in Terminal 4), and Amsterdam's Schiphol airport. The concept: Catering to those with a long layover, these glossy, no-nonsense capsule hotels are small but convenient for business travelers -- or someone just looking for a nap and a shower. What you get: A windowless room (about 75 square feet) that looks like a cruise ship cabin -- there's a shower, a TV, a fold-out work desk and an overhead storage rack; Wi-Fi is free. Bonus: a 24-hour room-service menu of snacks and drinks delivered within 15 minutes. What it'll cost: There's a four-hour minimum, which costs about $36 for a standard cabin in the London locations. After that, pay by the hour (about $10). Premium cabins are probably better for shares -- those start at $57 for four hours. yotel.com. Where: Antwerp, Belgium; Maastricht and Amsterdam, the Netherlands. The concept: A completely self-service hotel. You check yourself in at the kiosk and buy everything with your hotel key card. What you get: In the center of each room is a Cubi, a 75-square-foot enclosed platform for the bed, a bar-like work-and-dine space and the bathroom. The lighting is at your discretion -- Mellow Yellow, Deep Purple Love -- it's all pretty club-like. There's a vending machine in the lobby filled with drinks, locally made snacks such as organic bread and things you may have forgotten -- like neckties. What it'll cost: From $91. qbichotels.com. Where: Near Amsterdam's Schiphol airport and in central Amsterdam's posh Zuid neighborhood, which started taking guests this April. What you get: Only single-bed rooms are offered, each with an ultramodern cylindrical shower. Use a control panel (called a moodpad) to manage the room temperature, blinds, alarm clock, stereo and lighting -- there are clever choices like "I'm here to party," with intense colored lighting and dance music. There's also a 24-hour self-service cafeteria; if you're craving a martini, a bartender is on duty in the evenings. What it'll cost: From $109. citizenm.com. All three of these mini chains have plans to expand -- some more than others. CitizenM will open a third hotel in Glasgow, Scotland, in 2009, and plans to expand into London and New York City in the next five years. Yotel will open in London and then at all major airport hubs in Europe and the U.S., but there are no fixed dates. Qbic hopes to pursue a franchise model -- if you (really) like what you see, apply to be a franchise-owner on the Web site.